My husband did not like dogs until he found our 8lb toy poodle, Max. My family in England only had large dogs so I could not imagine having such a small dog. One Sunday, my husband and I decided to visit a puppy store and this is where we fell in love… Max picked my husband! This playful, feisty, loving little guy who makes up his own games, loves to hunt lizards, smell everybody’s feet, stole our hearts. He is just a teddy bear, snuggle bug that has his parents wrapped around his little paw. 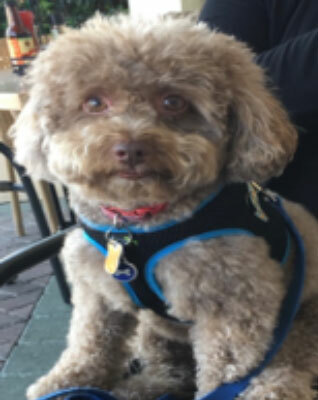 We have become the chocolate toy poodle family.. our son in NJ and my parents in England now also own the exact same breed and color all because of little Max! Congratulations to Max and the Littenberg family for being chosen as Calusa’s December pet of the month.